The Mazda MX-5 Miata RF, as in retractable fastback, was just introduced last year. Its newness to the market has not kept Mazda from messing with success. For the new model year of 2018, Mazda is adding content to the car and this month marks the first month that the RF Miata style will be available in all U.S. markets. In the Miata RF body style, the Club trim is the entry-level trim. This trim gets new standard heated cloth sport seats. For 2018 every trim of the Miata RF also gets advanced keyless entry. Mazda is also adding heated leather-trimmed seats to the RF Club’s Brembo Brake and BBS Wheel Package. The impressive list of standard features in the Club trim continue. These include LED lights, Mazda Connect infotainment with a seven-inch display, a USB port for each occupant, Bose Premium Audio with 9 speakers, and a leather steering wheel and shift knob. On the safety side, in addition to all the standard safety one might expect, the RF Club also has blind spot monitoring and rear cross traffic alert. Unlike most modern vehicles, many drivers find that convertibles with the roof up, do indeed have a blind spot, so the technology being standard makes good sense. Other changes that Mazda has made for 2018 include changing the red, white, and blue colors for the Miata. Eternal Blue Mica replaces Blue Reflex Mica; Snowflake White Pearl Mica replaces Crystal White Pearl Mica; and Soul Red Crystal replaces Soul Red Metallic. We’ve seen the 2017 and 2018 reds side by side and the new 2018 Soul Red Crystal is stunning by comparison to the outgoing color. The 2018 Mazda MX-5 Miata RF Club Manual Transmission (MT) starts at $32,800. The Automatic Transmission Club starts at $33,400. The Miata RF Club MT with the Brembo/BBS package rings in at $36,570. 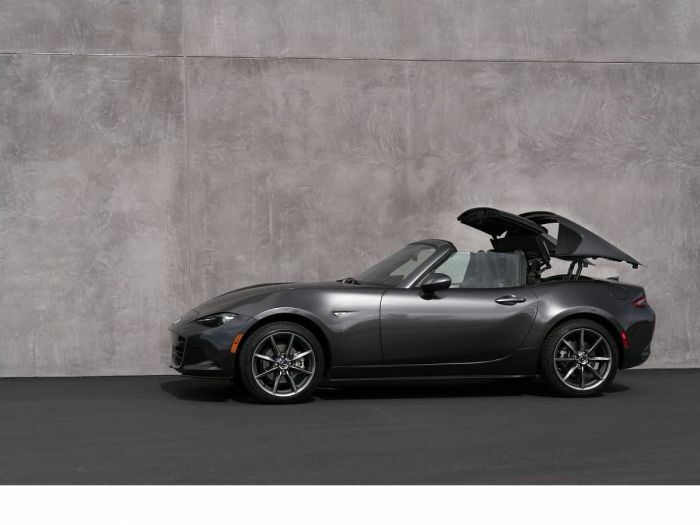 The Miata RF Grand Touring MT starts at $33,640, the Miata RF Grand Touring MT with Auburn Nappa Leather starts at $33,940, and the automatic transmission adds $1,075 to any Grand Touring trim. The new Red adds $595 (worth every penny), the machine grey metallic adds $300, and the new white adds $200. Related Story: Mazda N. America Reverses Course - Will Offer Miata With Cherry Top in U.S.